Slovak Internet eXchange (SIX), operated by the Slovak University of Technology in Bratislava, has today completed the migration to the new infrastructure consisting of four Huawei CloudEngine switches. The new core provides SIX members with 192 10GE/1GE ports which are available in fiber and copper variants. All switches support wirespeed forwarding for all packet sizes and are interconnected in redundant 2*40GE ring topology offering 160 Gbps of inter-switch bandwidth. 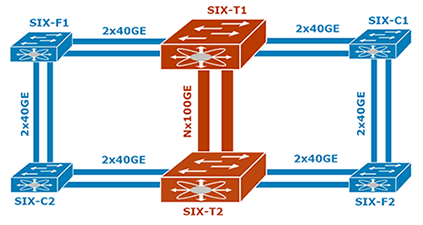 SIX core could be reconfigured without any service impact and is easily extendable to support 40GE or 100GE access ports when needed. The major difference from the previous setup is the deployment of TRILL (TRansparent Interconnection of Lots of Links), which provides SIX with shortest-path L2 packet forwarding, optimal utilization of all core links and fast convergence. Unlike the usual spanning-tree approach, TRILL enables SIX to have all core links always in forwarding state and evenly distributes traffic over multiple equal-cost paths. Huawei CloudEngine switches parse L3 and L4 headers inside the TRILL-encapsulated packets, which ensures fine-grained per-flow load-balancing for both IPv4 and IPv6 and maintains correct packet order within all flows. "For quite a long time, we've been looking for smart IP-like routing functionality for L2 ethernet packets, without spanning-tree blocking all our redundant links and without the burden of MPLS. TRILL finally makes all this possible - and I'm glad that we today managed to bring this modern networking technology to all SIX members" said Marian Ďurkovič, technical manager of SIX. "Huawei is confident that we are able to fulfill the requirements of such a challenging customer as SIX. We are confident that CloudEngine series will meet all requirements in such a difficult environment. The aim of CloudEngine switches that have been offered is because this series can effortlessly meet current bandwidth requirement and provide adequate potential for future expansion of Slovak Internet eXchange" said Tomáš Zloch, Central Product System Engineer, Huawei Technologies.